"Live a Longer, Happier Life"
This blog highlights information found in our RETIREMENT PLANNING MADE EASY live insurance CE class. Most of us want to live a longer and happier, more fulfilling life, but the real question is how do we go about achieving it? In our live classroom insurance CE course, RETIREMENT PLANNING MADE EASY, we spend some time discussing life expectancy. It's an important and fundamental part of any solid retirement plan, and in that discussion, we also look at research on life expectancy and we've uncovered some interesting and life-giving trends. Without giving too much of it away, one of the MOST important things to living a longer life is SOCIAL INTERACTION. 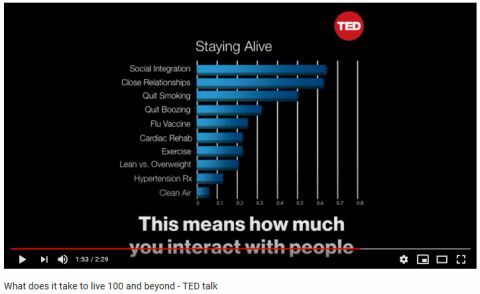 This we uncovered from a TED Talk entitled, WHAT DOES IT TAKE TO LIVE 100 AND BEYOND. In it, Ms. Asea First discusses research that indicates more than clean air, exercise, and quitting smoking, our close relationships and social interactions serve to help us live longer and in the process, make us happier. Over and over again, in the interesting and fun research we review in this course, this same common theme emerges, "The more socially engaged we are, the longer we will live and the happier we will be in the process." Come join us for live classroom insurance CE. There are tons of options coming up for 2019. Just look at the map to the right, and by the way, if you are a Wisconsin or Iowa insurance agent, you can attend any Minnesota location and get insurance CE credit for your resident state. If you travel to the class, it is even more opportunity to network socially further increasing your life expectancy. Heck, if you have attended our live classroom insurance continuing education, you know how much fun we have in class. If you've never attended a Bryan Ventures insurance CE class, you should. Seriously. Not only will you have a great time, but your family and friends will appreciate the steps you took to ensure a happier and healthier you. WE CAN STILL RESERVE SPACE AT OUR DESTINATION CE CLASSES. Come join us and we can tell you all about these awesome changes while sitting next to a tropical beach. It's sure to be a GREAT time.